Life is a circus, why not have some fun with it and dress up to match all the insanity? This month’s theme will be Vintage Circus. Dress as a sad clown, a mime, a muscle man in a classic striped tank, a lion tamer, or bring your parasol, tutus, suspenders, your stripes, your sparkles, bloomers or tophat for some highwire tightrope walking! 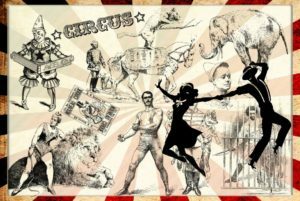 $2 OFF Drink Specials when you come dressed-to-impress to the theme: clowns, mimes, strong persons, acrobats, animal tamers, wild beasts of wonder and more…. Prizes for Most Entertaining Circus Act Costume! Plus more fun and carnivalesque surprises! Spread the invitation on Facebook!